Charlie Backer founded Hot Charlie's in his home several years ago. He officially launched Hot Charlie's hot sauces in August 2017. St. Louis-based Hot Charlie's is partnering with Palo Foods in Sheboygan Falls, Wisconsin, to roll out Hot White Cheddar Popcorn made with its hot sauce dust. "Spicy food needs spicy flavor," officials said in a statement. "In the Hot White Cheddar you'll experience a flavor explosion with Hot Charlie's Hot Sauce Dust and fresh Wisconsin cheese. It's not too hot, it's just right, and totally addicting." Charlie Backer founded Hot Charlie's in his home several years ago. He officially launched Hot Charlie's hot sauces in August 2017, and the brand is now available in more than 90 retailers across Missouri, Kansas and Illinois. The Hot White Cheddar Popcorn will land at Dierbergs and Schnucks stores May 1, officials said. It will roll out nationwide shortly after that. Backer worked with Palo Foods for several months to create the popcorn flavor profile. 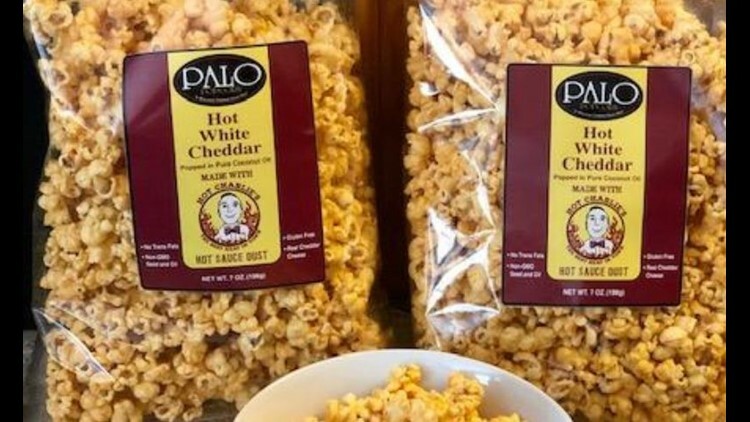 "We take pride in our cheddar popcorn items delivering bold, intense flavors and the Hot White Cheddar Popcorn certainly delivers on that promise," Matt Haas of Palo Foods said in a statement. "This is out first co-branded effort and we are thrilled to partner with Hot Charlie's as a company – the high quality of their Hot Sauce Dust complements the quality of our pure coconut oil and real cheddar cheese as ingredients in the Hot White Cheddar Popcorn." Palo Foods was founded in 1963 and is a family-owned, small-batch manufacturer of gourmet cheddar popcorns. The company distributes its products in grocery, convenience, mass, liquor and gourmet food stores across the country.